I navigate my days to a soundtrack of rising, surging noise. I close my eyes and sway to the swell, bumping people on sidewalks and drawing their glowering protest. Unseen carpenters create the framework for country barns, the whine of their saws echoing as I do my own chores. I vaguely understand the origins of my constant companion, the noise which my senses validate but which no one else hears. Your brain doesn’t work right, said one doctor, as I stared at her in confusion. Even so, but the noise? You mean, other people can’t hear this? I didn’t know whether to envy or pity those other souls with their silent heads. This morning, as I made my breakfast, I hummed to the chorus inside me. Today I heard a different noise, more rhythmic, concerted, almost organized. I stopped. My eyes darted around my space. I fixed my gaze on the door, adorned with hanging jackets, blue, with a doll quilt covering the window. My hand rose. I turned the lock. As that door came towards me, the noise sharpened and swelled . I stepped onto on the porch and saw what until then, I only heard as another phantom chorus of my jangled nerves. 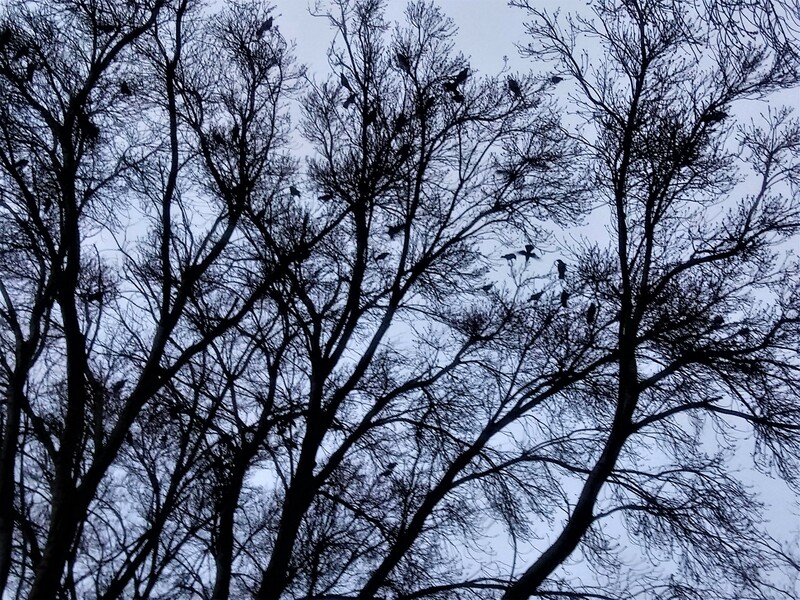 The noise became sound, the sound of a thousand crows soaring above my tiny house, heralding the dawn, swooping across the sky to land on the swaying branches of the California oaks. 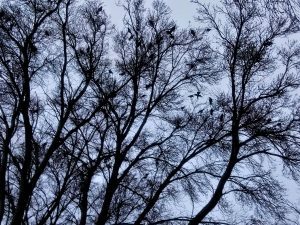 I reveled in their joy until the cold crept into my bones, and then, I stood a little longer, so I would not forget the morning song of the migrating crows. It’s the nineteenth day of the sixty-first month of My Year Without Complaining. Life continues. Later today, I will link a one-minute video of the crows. Watch for it. Have a lovely Saturday, my friends! This entry was posted in Uncategorized on 19 January 2019 by ccorleyjd365.